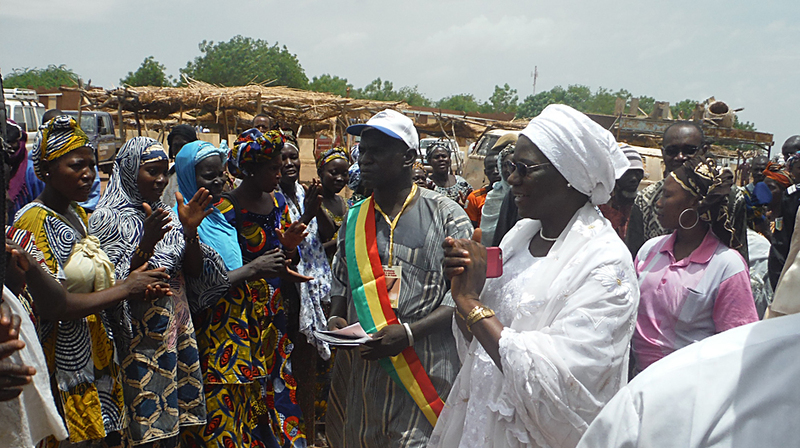 Dr. Marie Madeleine Togo is the minister of health for the Republic of Mali, responsible for protecting her almost 17 million fellow citizens from all kinds of diseases and dangers. That covers a lot of people and myriad maladies, but her work to eliminate Guinea worm disease goes beyond a professional interest in public health. At the conclusion of the 2016 annual program review at The Carter Center, when health program partners from all over the world gathered in Atlanta to discuss progress and strategies, Togo confided her own family’s experience with the disease. “Some of you may giggle when I tell you that I am the best-placed person to speak of the fight against Guinea worm in Mali,” she told former U.S. President Jimmy Carter and dozens of her peers. When the program started in Mali in 1992, that country had 16,024 recorded cases of Guinea worm in 1,164 villages, she said, and half of the cases were in Dogon county, where the health minister is originally from. As of the end of 2015, Mali had detected only five cases — among the last 22 in the world, whereas once there were millions. Dogon county now is free of Guinea worm. For the health minister, this was a first-person history. Thankfully, the story doesn’t end there. Togo grew up to become a physician and is now the head of the Department of Health and Public Hygiene of Mali. She said Malians have great respect for The Carter Center and its founders, who have helped them reach the brink of wiping out the ancient disease. She noted that Mali’s culture has a ceremonial mask called a ciwara (pronounced "tchee-wah-rah").